Mortal Kombat Deadly Alliance is the latest in the Mortal Kombat series, and it's the best game in the series since MK2. 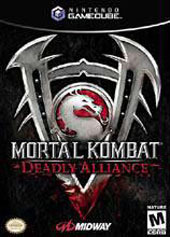 While MK4 did receive some acclaim when it came out, it still felt like the 2-D MK games, even though the series evolved to 3-D. MKDA refines the game play in a 3-D world, and tries to further deepen the experience by including 3 different fighting styles (different for each player) that can be changed on the fly. And it works in it's favor, since it brings a unique quality all it's own when compared to other fighting games. But therein lies a frustrating complexity when it introduces the "style branch" combos. More on that later. A little backdrop on how the series progresses now. Shang Tsung and Quan Chi have joined forces (hence the deadly alliance) to take out Shao Khan and try to take over the universes with the souls he stole and transplant them into a stone army. Not only did they go after Shao Khan, but they went after Lui Kang as well, who has been a staple in the MK universe for years. But with one snap of the neck, he's done with. Kung Lao was the first to know, and informed people that he knew along the way about what had happened. Now Kung Lao, Sonya Blade, Princess Kitana, Johnny Cage, Sub-Zero and others are trying to stop the Deadly Alliance forces from taking over. If this sounded like a jilted explanation, check out the Midway site for a more accurate description. Now, on to game play! MKDA feels like the more modern 3-D fighting games such as Tekken, Virtua Fighter and Bloody Roar, except it has the MK twist. Where would MK be without the blood and violence? On store shelves, like the SNES version of the first MK back in 1993. Aside from the gore, MKDA comes with a whole new fighting system that works, in most respects. Each character has 3 different fighting styles, each with their strengths and weaknesses. It's great to be able to change your style quickly in mid-game, and try something new that doesn't work a different way. The third fighting mode is where you can use a weapon, either a blade or a wooden object. And some weapons have a little depth to them as well. Some can execute devastating strikes, evasive maneuvers, or even a life draining impale move. Of course, you'll need to decide if using some of these moves are wise, since it may cause you to lose your weapon for the rest of the match, plus the added vulnerablillity. The thing I hate about the system, however, is the combos. some seem pretty standard, then some get ridiculous. For one combo, you may need to press 7 buttons. Then comes the style branch combos, which can be simple, or require a little finger work. Some, like Raidens final Style Branch combo seems impossible. And I mention Raiden, because you NEED to execute this in the Konquest mode. The modes of play seem like quite a bit at first, but in a way, I was a little disappointed. I though there was a little more to the Konquest mode rather than just executing moves and combos. Some are actual fights or challenges, but the mode seems a bit flat. Compared to the Quest mode in Soul Calibur, this really doesn't hold up as an adventure. It does provide a lot of background information, though. You also have the arcade mode, which is pretty much what you expect. Fight your way to the end, with some Test Your Might/Sight challenges in between. It seems a little lacking, but it can be fun, if not challenging. But all this play doesn't come without reward. You can earn different Koins to unlock coffins in the Krypt, which contains a whole bunch of secret goodies that is too much to list. This is the best feature of the game, which encourages the gamer to keep playing for something cool. And with 676 coffins, you'll be busy. And add in the already unlocked content such as the Adema music video, the videos for the History of MK and "A Day of Making MKDA", there's a lot to see and do. This game is one of the richest in content I have ever seen. The graphics are pretty good. Using the RendeWare platform, which was used in games such as Burnout. I'm not sure what use it has here other than the particle effects, which there is a lot of. The models, while not lifelike, look pretty good. All I care about is how good Kitana looks, and thank god she does. And ever since the DOA series, we've seen a lot of "booby-jiggle" in fighting games, and here it is no different. In some cases, they flop around quite a bit. Kind of a shame that you beat the living crap out of them, huh? The arenas look very good, with some background effects and a good use of lighting. I would have like to have seen a little bit of bump mapping, but oh well. The fighter animations are done very well, and move very fast and fluid. This could be one of Midway's best looking games, and totally makes up for the GC version of SpyHunter. And Midway should be pat on the back for some of the clearest video on a GCN game in quite awhile. The sound is good, but probably could have used more. It seems like all the fighters do is grunt and scream. Not many voices, and even some of the women sound the same. But the music is good, and the sound effects are great, even if some sound a little gross. Nothing is compressed to hell or done badly here. Save for the GC controller, MKDA is an outstanding fighting game on the GCN. It looks and plays great. If you can't tolerate the GCN's D-pad, and own another system, you may want to pick up that version instead. But the scheme can be mastered, and the game is fully playable. Consider this the MKDA for experts, because if you can master this controller for this game, then that's quite the accomplishment. Is it the best GCN fighter? Probably until Soul Calibur 2 comes out, but there is so much here, it definitely stands out from the crowd. Mortal Kombat is back, and it's better than it's been in years.